Born May 26 1905 in Hubei Province and died January 7 1974 in Beijing. In September 1955, Chairman Mao Zedong conferred medals to Wang Shusheng, director of the General Ordnance Department, concurrently vice defense minister at the Decoration Ceremony. 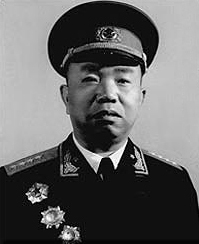 Wang Shusheng was conferred the rank of army general in 1955. 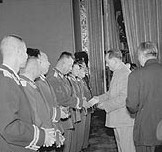 In September 1955, Chairman Mao Zedong conferred medals to Wang Shusheng (left 4), director of the General Ordnance Department, concurrently vice defense minister at the Decoration Ceremony. In October 1959, President Kim IL Sung of the D.P. R. Korea led a party and government delegation to attend 10th anniversary of the founding of China. 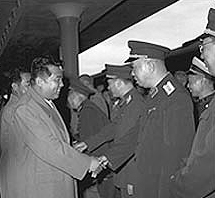 The picture shows Wang Shusheng (right) was seeing the delegation off at the railway station. 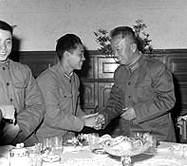 In 1963, the Ministry of Defense hosted a banquet entertaining the delegates from units attending the National Day celebration.The picture shows Wang Shusheng (the frist from right ) shook hands with Chen Daifu, a combat hero. Leaders of No.129 Division of the Eight Route Army and Taihang Military Region at the New Year Mass Greeting Party. 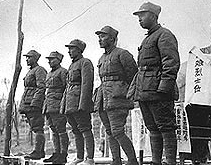 From left: Liu Bocheng, Deng Xiaoping, Cai Shufan , Li Da and Wang Shusheng.